After months of speculation that Mickey's Toontown would be torn down to make space for Disneyland Resort's new Star Wars Land, it now appears this quirky little “town” will be spared. Yay, Mickey! Mickey Mouse's house stands before the Hollywood-style Toontown sign in the cartoon mountains. 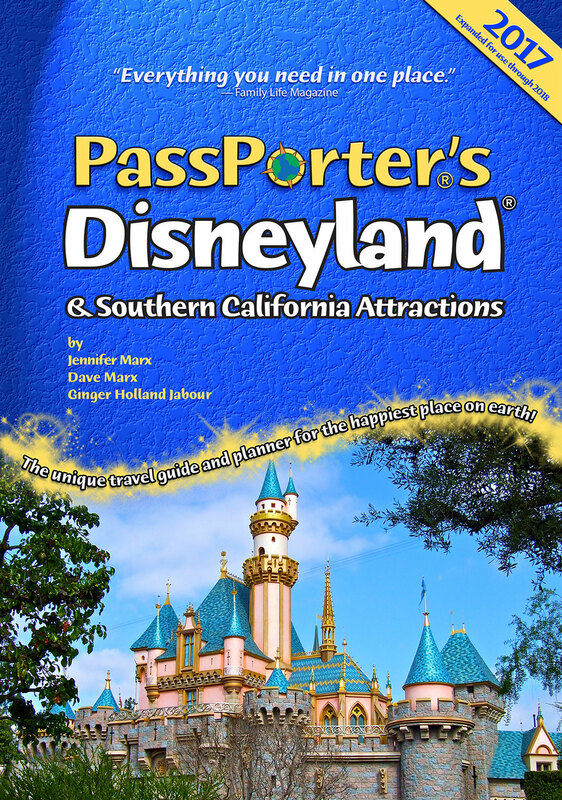 It’s hard for me to believe it now, but I visited Disneyland Resort in California several times without venturing near Toontown, assuming it was the same as the (now dearly departed) Mickey’s Toontown Fair at Walt Disney World’s Magic Kingdom in Florida. I couldn’t have been more wrong! 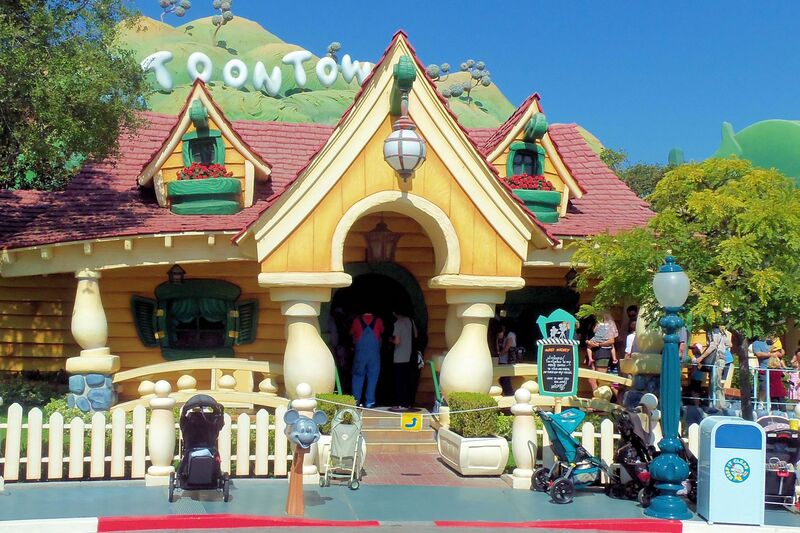 Mickey’s Toontown, which opened in 1993, is a happy place with attractions honoring the classic Disney characters, like Mickey, Minnie, and Donald, and some really not-classic, like Roger Rabbit and Gadget Hackwrench. From the moment you enter Toontown, crossing under a bridge next to “it’s a small world,” you see marvelous sight gags and slightly off-center items that make you look twice. 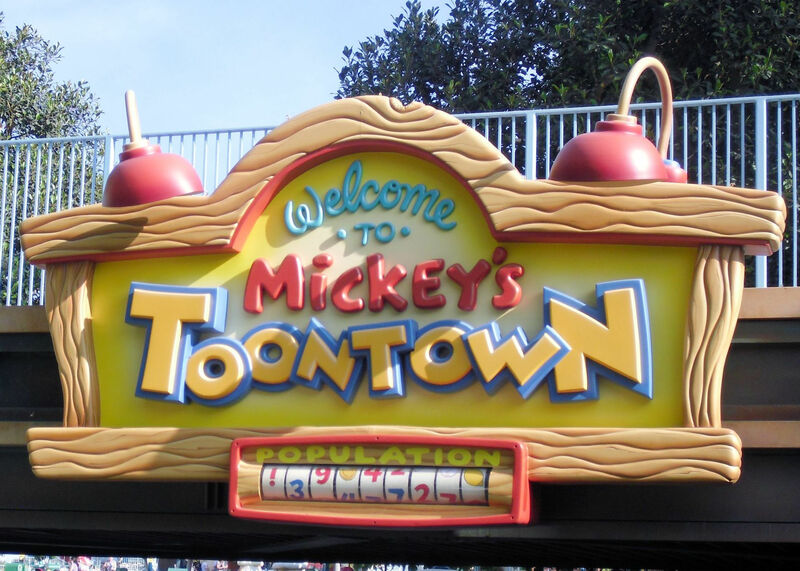 The Welcome to Toontown sign has crooked letters and a “population” meter that spins, rarely showing the same number twice. Emerging into Toontown proper, you see comic book-like buildings everywhere, with a gas station, post office, gym, bank, and power house. Tip: pull on the doors to the power house for a surprise. In fact, push or pull on all the props you see on the sidewalk—several have crazy sound effects. This “land” features only two rides, but the whimsical, sometimes zany sights are the real treat. As you enter, you’ll see on your right Roger Rabbit’s Car Toon Spin. This is a classic “dark” ride, meaning that you ride through scenes from Who Framed Roger Rabbit in a “runaway taxi.” I rode this recently, but it’s been so long since I watched the movie (which was released in 1988) that I didn’t recognize the scenes. Fans of the movie, however, will enjoy this ride. I’d call it a “C-ticket” attraction. It does some fast spinning—you can speed up the spin for some dizzy fun. 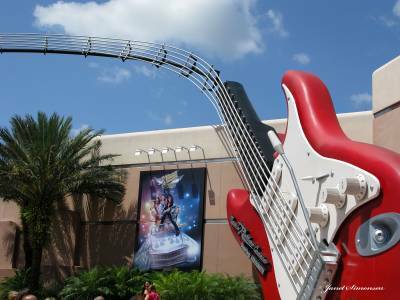 Expect very short waits for this attraction! Roger Rabbit also has a nice fountain in front. Toontown features three counter-service restaurants: Clarabelle’s offers the most variety, with salads, sandwiches, and ice cream bars; Pluto’s Dog House serves (you guessed it!) hot dogs and kids’ meals; and Daisy’s Diner has personal pizzas on the menu. Small tables with umbrellas and chairs are scattered about. The sign welcoming you to Mickey's Toontown at DisneyLand features a spinning "population" meter that rarely gives the same number twice. The Gag Factory—Toontown Five & Dime is a fun place to shop. You can buy Mickey ears and watch your name embroidered on the spot, browse the apparel, check out plush toys, expand your pin collection, and find the best assortment I’ve seen of Mickey-themed items for your kitchen and home. To the left of the entrance, you’ll enter the “residential” section of Toontown, centered around a fountain featuring Mickey Mouse conducting his Silly Symphony. It’s surrounded by built-in benches where you can relax and take in the sights. Directly behind the fountain is Mickey’s house. While the outside resembles the house that was in Walt Disney World’s Magic Kingdom, the interior is entirely different, and you can walk right up to everything. 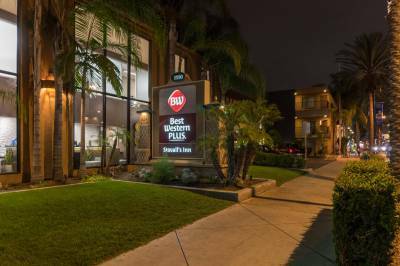 Tip: be sure to read the packages in the laundry room, and look for Pluto’s bed and doggy door. After winding through his house and the queue behind it, you’ll meet Mickey Mouse himself. The picture with Mickey looks as if the two of you, both mouse-sized, are standing on a mantelpiece by an old-timey upright telephone. Tip: Be sure to step back and get a picture of the Hollywood-like Toontown sign on the cartoon mountains behind Mickey’s house. Next door is Minnie’s house—again, much different from the one that was at the Magic Kingdom. As in Mickey’s house, you can walk right up and touch everything, even sit in her chair if you like. Tip: in the kitchen, check out the dishwasher, and open up the refrigerator to see what the lady mouse eats. Also check what’s on her computer in the parlor. At the end of the queue, you can often—but not always—find Minnie herself, on a pastel patio with a table set for tea, ready for a picture with you. The Chip ‘n Dale Treehouse is a playhouse and climbing area, set in what appears to be an immense old tree that features a porch, front door, windows, and dormers. While the Treehouse has no age limit, it’s probably enjoyed most by younger children. Donald Duck lives aboard his ship, “Miss Daisy,” on Toon Lake. His girlfriend’s likeness is the figurehead of this big white vessel. 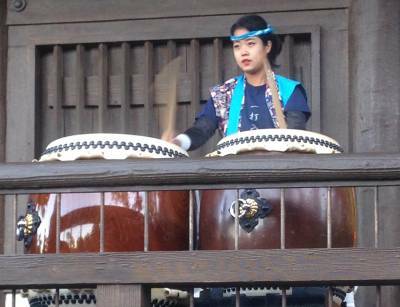 It’s not limited to children, and adults can also enjoy the theming. Donald’s sleeping quarters are fenced off from prying fingers with large netting, but through it you can see his hammock, sink, and footlocker. Tip: look on the wall by the sink in Donald’s room for pictures of some familiar avian faces. You’ll also see two big nautical-looking contraptions on different decks through which you can talk to someone on the other end. Oddly enough, Daisy Duck doesn’t have a house here. Goofy’s Playhouse is another interactive play area. Its sign says it’s for 2- to 5-year-olds, but it’s fine for adults to stroll along through it and admire the fun. The parlor has a piano whose keys make different, funny sound effects, and his backyard garden has many silly touches, from popcorn plants unsuccessfully guarded by a familiar-looking scarecrow to a twirling clothesline hung with Goofy’s clothes. Be sure to check out the droll architecture on the outside of the house. Toontown’s second ride—Gadget’s Go Coaster—is in the residential section, for some reason. It’s a steel roller coaster with seats designed to accommodate one child and one (medium-sized) adult. Children must be at least 35 inches tall and accompanied by an adult to ride this attraction. Rider swap is available on this ride, too. Mickey and Minnie are the only characters you’ll meet in their own houses, but keep your eyes open (and check your Times Guide) for other characters who will show up in town for pictures and autographs. As you pass through Toontown, make sure to take note of all the fun details Disney’s Imagineers have scattered throughout the area, from the street signs to the individual mailboxes at each house. 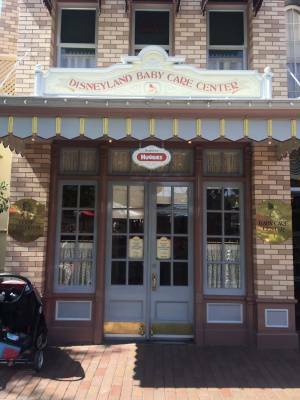 Kids will enjoy Mickey’s Toontown, but it is definitely not a children-only area. Real fans of the original “Fab Five” (Mickey, Minnie, Donald, Pluto, and Goofy) will have a wonderful time visiting their homes and finding the fun in this “Goofy” town. 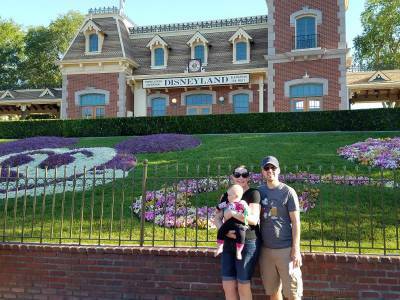 Ginger Jabour is a co-Guide for the Scrapbooking, Southern California Attractions, and Using Disney Tech forums on the PassPorter Message Boards. She lives in Ohio with her husband, Jay, and sons Matt and Mark, is retired from the Air Force, and is happily planning a birthday trip to Walt Disney World in November.